Cat llenties, L. Lens culinaris, Heb lenteza, Fr. lentille, Eng. lentil, a legume. The lentil is a pulse (grain legume) crop. If the lentil is not the oldest, it is among the longest cultivated cereals in the world. Archeological findings reveal its existence from 8000 BC at least. It is thought that it originated in the Near East and from there spread to Egypt, the Mediterranean basin, central and southern Europe, Ethiopia and then east to Pakistan, India and Afghanistan and China. By 6000 BC, the Greeks cultivated it. Lentils from the Bronze Age have been found around Lake Biel, Switzerland. Later Ancient Romans imported them from Egypt. Red lentils have been found in tombs from the Hun Dynasty in China (43-118 AD). The most common in the Medieval Europe was the French or European lentil with a grayish-brown exterior and yellow interior. The Egyptian or red lentil particularly was known in Al-Andalus. Some Gallegans maintain that in the year 365 lentils “rained from the heavens” near the Minio River and Lais, a village near this river. For this 100 Galician towns maintain themselves today by growing lentils. The Leonese, however, contend that the best are from Los Oteros. They have been used for soups, pottages, vegetarian stews with chard, pates and salads with feta cheese from time immemorial. During wheat famines, the round flat seed was ground into flour in both Spain and England. 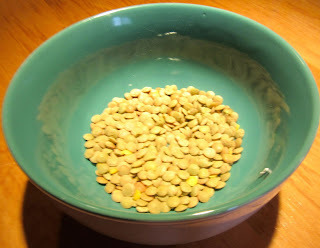 During Passover, Spanish Jews were allowed to eat lentils, to the distress of their eastern relatives for whom they are prohibited. 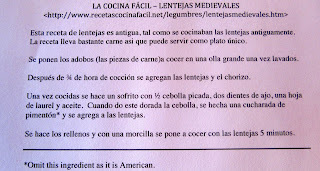 They had as many recipes for lentils as the Hispano Arabs in Al-Andalus, especially those with the prefix ’adas (pureed lentils) which included vegetarian dishes. For them the protein content, second to soy beans, lack of fat, sodium and cholesterol are so favorable that little must be added to complete their diet. It was a daily food during Lent throughout the Roman Catholic world. Areas in England today are still called “Lent-tills”. In Spain, variations came from the Arabs in Al-Andalus (who brought the lentil or “reintroduced” it to the peninsula in 1000 AD). 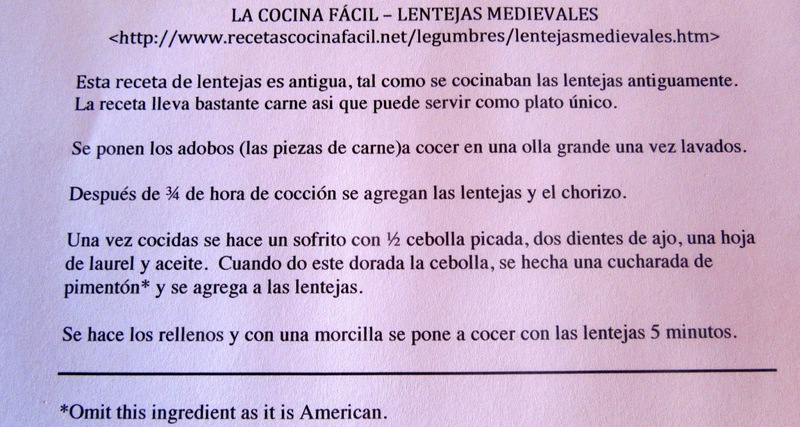 Christians’ invented lentil recipes. 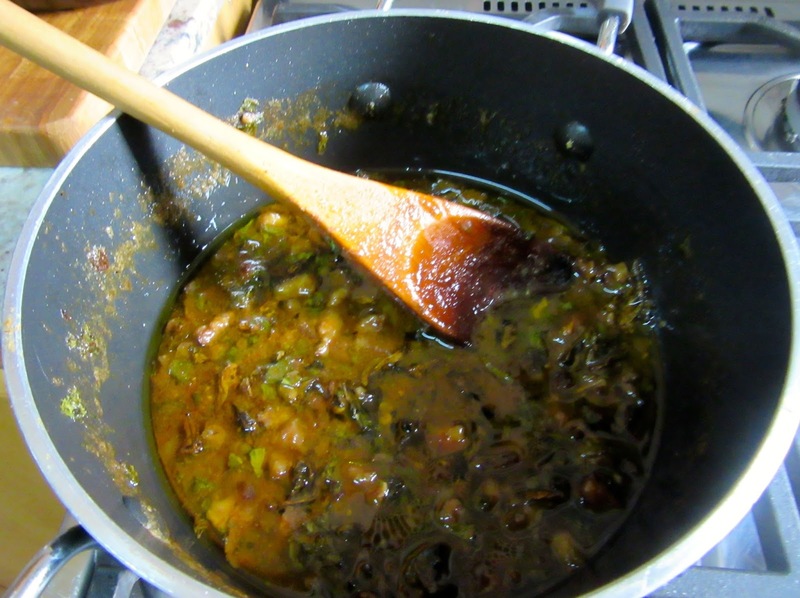 Vilanova instructed that lentils should never be served as a first course (unless pureed and seasoned with cinnamon, saffron, garlic and a little wine) as they could make the eater vomit. He advised that they should be served half way through the meal. They were considered the poor man’s dish or food for fasting. The friar of the Libro de Buen Amor ate them for supper on Thursdays. Knights ate them on Fridays and/or Saturdays (fish days in the medieval world) as reflected in the first chapter of Don Quijote. Strangely lentils are seldom mentioned in the chronicles but it is known that the English were instructed to eat them to counteract the smell of garlic. One of the few surviving recipes for them is in La Cocina Arábigo from the 13th C in which they are boiled with chopped onion, pepper and cilantro. At the end of cooking time saffron, a little vinegar and three eggs are added. Lentils were so plentiful that even livestock received their share as feed. Lentils were collected in June and stored in vats containing olio or other liquids. The nutritional value of lentils makes them one of the favored foods medicinally. Lentils were consumed by patients suffering from small pox and every other illness under the sun for fortification. Today, it is known lentils contain phytates, which are thought to prevent cancerous changes in body cells. This is a very old recipe. Due to the amount of meat, it can be served as an entire meal. Soak lentils in water overnight. Wash the ear, tail, spare ribs and cheeks and put them in a pot. Cover with water and bring to a boil. Boil gently. Three fourths of an hour later add the lentils and chorizo. Add blood sausage and cook 5 minutes.